This commode consists of a rouge marble top in excellent condition of serpentine form to the front with shaped sides and a moulded edge. This leads down to four serpentine shaped drawers all with a wide veneered Kingwood banding, leading to a smaller cross banding with a Kingwood parquetry inlaid design to the centre. 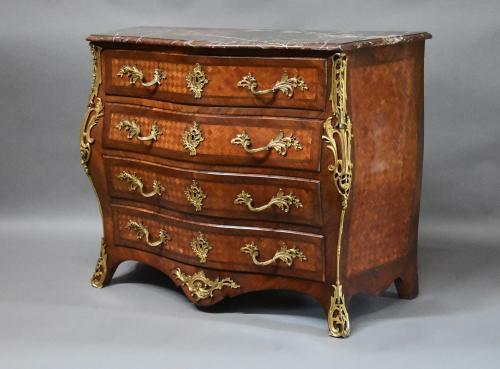 Each drawer has a central decorative ormolu escutcheon with two decorative ormolu handles of foliate design, the drawers being oak lined and the commode has it's original key. The decorative ormolu corner mounts to the top of the commode are also of foliate design and follow the shape of the commode leading down to foliate ormolu mounts to the feet at the front. Below the drawers the shaped frieze has a foliate ormolu mount to the centre of acanthus leaf design. The sides are of bombe form with Kingwood banding and large decorative Kingwood parquetry panels. This commode is in excellent condition for age, is of stable construction and can go straight into a home.